Our DoveTales journal is a manifestation of the Writing for Peace mission to promote writing that explores the many aspects of peace. One of our goals is to expose young writers to a diverse collection of thoughtful works by both established and emerging writers, as well as our Writing for Peace advisers. 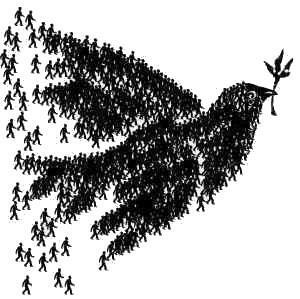 Writing for Peace has published six beautiful print journals, but in 2019, DoveTales is going online. We will publish two issues per year, February 1st and August 1st. The first online DoveTales will launch on August 1st, 2019, and will include our Young Writers Contest Winners. Our Guest Editor is Writing for Peace Adviser Patricia Jabbeh Wesley. The theme for the August edition is “One World, One People.” The reading period for this journal will open February 1st, 2019, and close on June 1st, 2019. The second edition will be published on February 1st, 2020. Our guest editor is Writing for Peace Adviser Robert Kostuck. The theme is to be announced. Reading period will open on August 1st, 2019, and close on November 1st, 2019. When you say “Family and Cultural Identity”, do you mean that both these themes must be explored in the writing? Or can it be about just one of these as well? Thanks for your excellent question. It does mean one or both. We’ll clarify our guidelines! May we submit previously published as well as unpublished? Yes, as long as you own the rights. Please let us know where the piece was previously published. Could you further clarify what you mean by “Empathy in Art”? Do you expect us to use art forms to discuss the topic of the other? Can we talk about our own experiences? And is there a limit of words? Oh and can we use art to demonstrate an idea maybe? Thanks for your question, Nawal! Yes, you are welcome to write about your own experience in the nonfiction division. Unfortunately, we are not able to accept art for the your writers contest, but you are welcome to submit it for consideration to DoveTales, an International Journal of the Arts. You’ll find the submission guidelines above. Good luck! Is this only for young poets? Is 67 young enough? DoveTales is open to all ages. What is the word count range for the dove tales submissions?